Millennials, the word is out that you love Denver. It makes sense. Like you, the city is youthful, eco-conscious and has its pulse on technology. According to a survey by Abodo, an apartment search website, millennials ranked Denver as No. 8 on their list of “perfect cities.” Denver ranked higher than San Diego and Boston on the Top 10 list but lagged behind big metropolises like New York City, San Francisco, and Chicago. (Two Washington cities, Seattle and Portland, also landed on the Top 10 list). Defined, millennials, also known as Generation Y, were born in the years ranging from the early 1980’s to around 2000, with no precise dates nailing down this generation whose members are known for their love of tech, adventure, and collaboration. Oh, and another reason Denver might be a draw to this generation? A Pew Research Poll found that 84 percent of Millennials favor legalized pot and Denver is one of the first cities to legalize marijuana. Whether you’re looking to relocate to Denver or just want to come for a vacation, we’ve taken the top qualities millennials say they want in a city, according to the survey, and are sharing what Denver has to offer. The No. 1 quality millennials want in a city is a friendly job market. Denver scored No. 12 on a 2016 study by WalletHub that revealed the best cities for finding a job. Millennials, turn your attention to the River North (or RiNo) neighborhood, where co-working spaces are a boon to the local economy. The neighborhood has turned dilapidated old factory buildings into hip new co-working spaces. The Taxi complex, an old Yellow Cab depot, for example, is a mix-used development with residences, retail, and companies--everything that ranges from realtors to artists to architects. Prepare for heartbreak if you were hoping to move here millennials. You might be better off vacationing in Denver because apartment costs are on the up-and-up and rental vacancies have been hovering at all-time lows. As of May 2016, the average rent in Denver is $1,580 per month. If you’re visiting, check out some cool, new hotels, like The Art Hotel, which is located smack-dab in the middle of Denver’s vibrant art’s scene, with art and history museums in every direction. And did we mention there are adult coloring books and massive bathtubs and cool city views? Plus, you can sit out on Fire’s patio, by, you guessed it, a fire pit and enjoy craft cocktails, a nearby candy bar and art displays throughout the hotel. Check and check. Denver is home to an epic parks system. There are 20,000 acres of urban and mountain parks in the City of Denver’s inventory. Get in on a game of volleyball during warm months while at Washington Park, enjoy food truck festivals at Civic Center Park or take a scooter up to Red Rocks, which sells out concerts and movie nights, but is also the stage for weekend workout warriors. When it comes to hikes, Colorado is well-known for its massive fourteeners. But there are plenty of low-key, moderate hikes within a half hour of the city. The culinary scene in Denver is phenomenal, no doubt. When you land at Denver International Airport, you’ll quickly be greeted with gourmet local food. Root Down in the airport’s Terminal C serves up dishes that are organic and local whenever possible and offers plenty of vegan options for breakfast, lunch, and dinner. From a farm-to-table cobb salad to cranberry-chipotle duck wings, the restaurant takes airport dining to a new level. Once in downtown, set your sights on the rooftop at Tamayo, one of famed chef Richard Sandoval’s restaurants, and toast to its massive tequila list and modern Mexican fare. 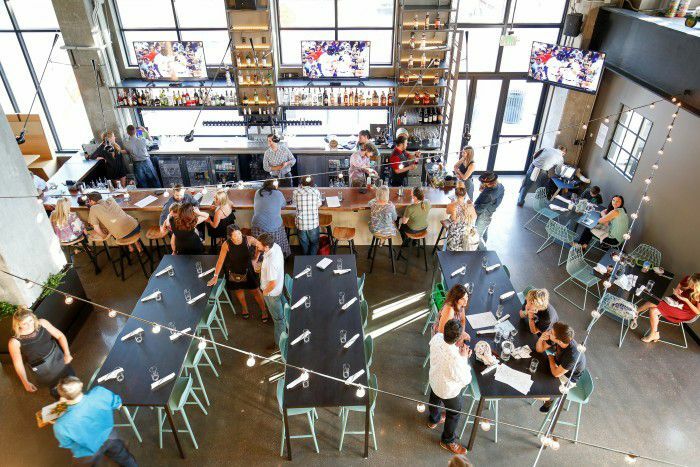 Or, check out one of Denver’s newest restaurants, The Pig and The Sprout, in the Union Station neighborhood, which is getting rave reviews for its fun atmosphere and innovative menu. Or, head a little west to the Highlands neighborhood and order up some ceviche at Lola’s Coastal Mexican, a modern coastal restaurant with an upbeat vibe. You’re a long way from New York, but still, there are some pretty amazing pizza shops hidden in Denver’s neighborhoods and off the beaten tourist path. For a slice of New York in Denver, head to Brooklyn’s Finest Pizza for some pepperoni pinwheels or a “Hell’s Kitchen” pizza with sausage, garlic, cherry peppers, and fresh mozzarella. The pizza shop is across from Regis University, a private Jesuit college. Another great Colorado pizza joint is BeauJo’s, complete with fluffy, doughy crusts that are served with bottles of honey for your dunking pleasure. Or, if it’s late night and you’re partying downtown, stop into Two-Fisted Mario’s, which is a popular joint after the bars let out. Sure, Denver has some standard movie theaters. But, there are some movie venues that get five stars (or two thumbs up). Take for instance Film on the Rocks, a concert-comedy-film series that takes place in the summer at Red Rocks Amphitheater. Or, The Alamo Drafthouse which serves food and cocktails to you at your seat and occasionally brings back older, popular movies for special screenings. For artistic or independent films, check out the Mayan Theatre, which also shows classic films every Wednesday. Night owl? Head to the Esquire Theatre for midnight movie showings of cult classics on weekend nights. Another option: Denver’s new drive-in movie theater that plays double features on weekend nights. During the summer, you can also watch flicks outdoors at various venues, including Little Man Ice Cream on Friday nights. If you’re visiting Denver, you can easily go car-less. The LightRail will shuttle you about the city and southern suburbs and, to get between the city’s distinct neighborhoods, you can hop on a Denver B-Cycle bike share. The 16th Street Mall Ride is a free shuttle that zips up and down the tourist-heavy 16th Street mall, where you’ll find shops, restaurants, and bars. Denver consistently ranks as a fit city, so walking from point A to point B is something you’ll see locals do often. But, if anything, the city is more multi-modal (read: Walk to a bus station, take public transportation, and move around on a bike-share bike during the day). Denver has become a popular vacation destination for the Gay, Lesbian, Bisexual, Transgender, and Queer communities. OutTraveler has named Denver one of its best up-and-coming destinations and Denver has one of the country’s largest PrideFest celebrations in June and The Colorado Gay Rodeo Association holds a rodeo in July. Denver’s first pride celebration occurred in 1973 as a picnic in Cheeseman Park and the state legalized gay marriage in October 2014. Like the produce, Denver and the surrounding ‘burbs have plenty of great farmer’s markets to pick from. The Union Station Farmer’s Market on Saturday mornings at 1701 Wynkoop St. is a favorite because not only are local farms present, Denver chefs put on a cooking demonstration from 10 a.m. to 11 a.m. On tap for the summer season are chefs Travis Messervey, of Beatrice & Woodsley on July 2; Franco Ruiz, of Fruition on July 9; Kelly Whitaker, of Basta and Cart-Driver on July 16; Paul Reilly, of Beast + Bottle on July 30. Given your taste for local coffee shops and non-chain restaurants, we’re guessing you prefer local over big-box when it comes to shopping, too. Denver has plenty of malls, from the downtown 16th Street Pavilions to the Cherry Creek Mall in east Denver to the massive Park Meadows Mall in Centennial. But for a fun shopping experience that balances local with big brands, head to Aspen Grove, 7301 S. Santa Fe Drive in Littleton, which is about 30 minutes south of Denver, is pet-friendly and is outdoors. You could spend a whole afternoon in the Tattered Cover, a local bookshop and favorite among locals. Or, shop stylish dresses and jewelry at the local Fab’Rik boutique and satisfy your sweet tooth at GiGi cupcakes. The mall is also home to retailers like Gap, Banana Republic, and Pottery Barn. Denver has some top-notch coffeehouses scattered throughout the city that have their own personalities. One that’s a favorite among millennials? Huckleberry Roasters, 2500 Larimer St. in Denver. Follow them on Instagram. They’re constantly changing up their sandwich board with fun expressions. The coffee shop recently teamed up with Denver chef Chris Bell to debut Port Side, a restaurant next door where you’ll find an evolving menu. Current offerings include some breakfast crazes like creamy avocado toast, topped with radishes; a kale smoothie that’s gussied up with a little maple syrup as well as blueberries, bananas, ginger and coconut milk and breakfast staples like overnight oats and egg sandwiches. We’ve got mountains within a 30-minute drive for Denver, but come up short on beaches and lakes. (Unless you count reservoirs? In which case, head to Chatfield Reservoir and rent a stand-up paddleboard in the gravel quarry). However, the Platte River runs through downtown. Perched on the river is Confluence Park which is a perfect spot to picnic, a huge REI as well as places where you can rent kayaks to paddle about on the city river.